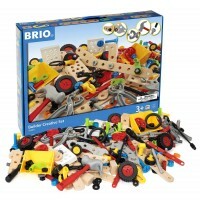 Learn about the domino effect with this open-ended domino building set by Hape. Children love building, and especially falling, dominoes! 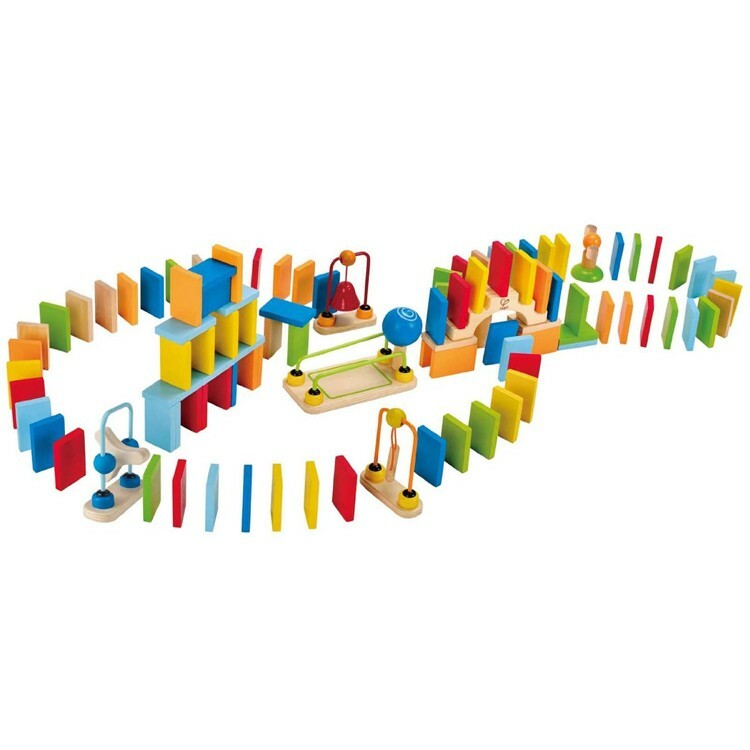 It's fun to construct an obstacle course for wooden dominoes and experiment with the falling row of dominoes. 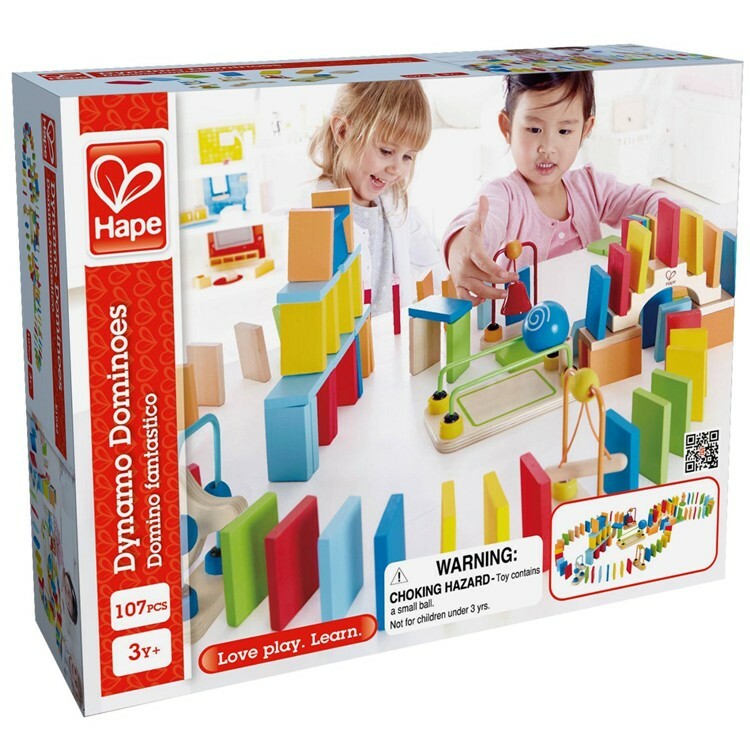 With Hape's Dynamo Dominoes Building Domino Chain Set your child receives 107 wooden pieces to explore the domino effect and play. 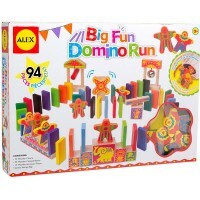 This building dominoes set comes with 100 brightly colored wooden dominoes, and special obstacle parts to make obstacle course construction more fun. The special parts include a railed bridge, red bell, hanging rails, and other cool pieces to make the falling domino chain more creative. Design a course, build a domino chain, and tap on one domino to see all multi-colored dominoes in a row go down. 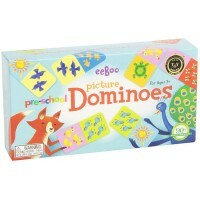 With the Dynamo Dominoes Building Domino Chain Set children build a different domino trail every time they play. 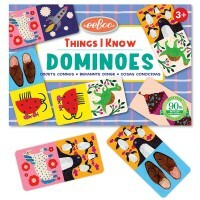 This domino building set from Educational Toys Planet is a great open-ended construction toy for children of all ages, perfect for home or preschool classroom play time. 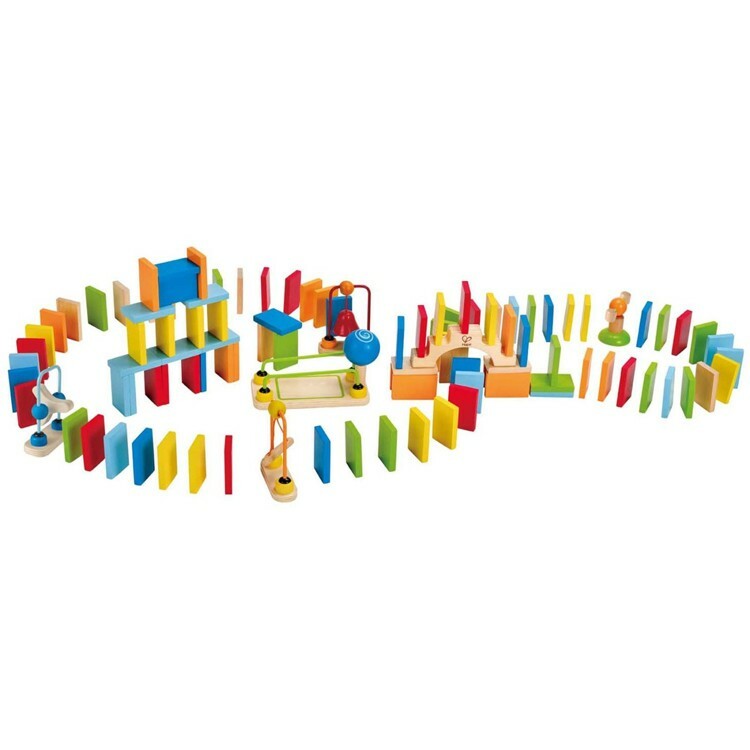 Dimensions of package 3.5" x 10.2" x 9.5"
Write your own review of Dynamo Dominoes Building Domino Chain Set. 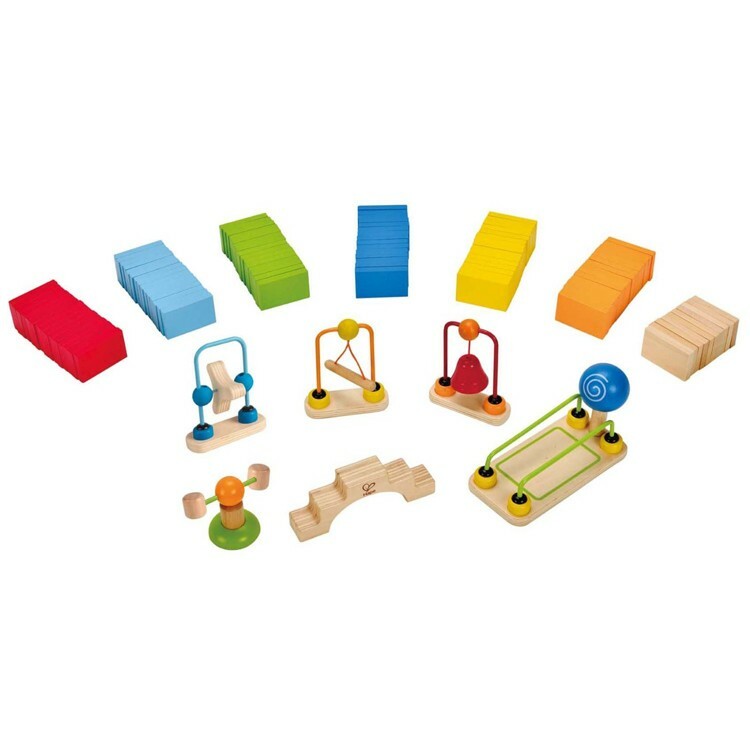 Rating: 5 Good quality by Hape Toys My kids love this set. I'm happy it gets them away from their tablets. Good planning/problems solving skills. Rating: 5 My 6 yr old still enjoys these. cute gift by Hape Toys Cool gift for kids. Great way to use imagination. Rating: 5 Very nice set! by Hape Toys Good quality. This is a gift. Can’t wait to see the recipient’s reaction. 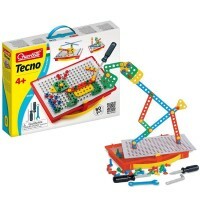 Rating: 5 Excellent stem toy by Hape Toys Gift for kids! 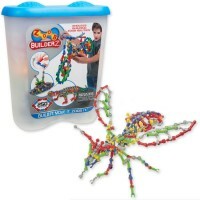 great building toy great forSmall hands very well made toy! The box never gets closed because they are always playing with this toy! Rating: 5 Fun for the whole family by Hape Toys Good quality. The extra features add to the fun. 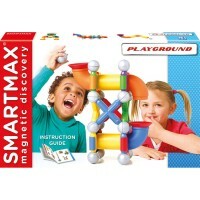 Rating: 5 Learming toy by Hape Toys Great to learn with. Rating: 5 my 5 year old nephew LOVED his birthday dominos by Aunt Chrissy in San Francisco My sister reported as soon as the dominos showed up both the 5 year old AND 10 year old could not stop playing with them and in fact they took top billing in the Santa loot that showed up 2 weeks later ! Thank you so much for making toys that kids really want to play with -- I'll be back again to shop your site when I need kid gifts.